Loss of white matter integrity may contribute to cognitive decline in both human and chimpanzee aging. This image depicts areas where white matter has been lost in Alzheimer's disease patients with the color red. Courtesy of Hui Mao. The instability of brain white matter in humans may contribute to greater cognitive decline during the aging of humans compared with chimpanzees, scientists from Yerkes National Primate Research Center, Emory University have found. The results, the first to examine white matter integrity in humans, monkeys and chimpanzees, are available online in the journal Neurobiology of Aging. The Yerkes scientists discovered that white matter — the wires connecting the computing centers of the brain — begins to deteriorate earlier in the human lifespan than in the lives of aging chimpanzees. “This knowledge is important because it will hopefully stimulate other scientists to investigate the molecular mechanisms responsible for more rapid white matter decline in humans and potentially lead to interventions to slow white matter aging,” says senior author James Rilling, PhD, a Yerkes researcher, associate professor of anthropology at Emory and director of the Laboratory for Darwinian Neuroscience. In the brain, gray matter represents information processing centers, while white matter represents wires connecting these centers. White matter looks white because it is made up of myelin, a fatty electrical insulator that coats the axons of neurons. If myelin deteriorates, neurons' electrical signals are not transmitted as effectively, which contributes to cognitive decline. Myelin breakdown has been linked with cognitive decline both in healthy aging and in the context of Alzheimer's disease. "Both humans' longer life spans and distinctive metabolism could lie behind the differences in the patterns of brain aging," says co-author Todd Preuss, PhD, associate research professor in Yerkes' Division of Neuropharmacology and Neurologic Diseases. "White matter integrity actually peaks around the same age in both chimpanzees and humans, but humans may experience more degradation because they live longer. Perhaps the need to retain brain capacity late in life is one reason increased brain size was selected for in human evolution," Preuss says. The team, which also includes collaborators at the University of Oslo, showed white matter integrity, as measured through a form of magnetic resonance imaging (MRI), peaks at age 31 in chimpanzees and at age 30 in humans. The average lifespan of chimpanzees is between 40 to 45 years. For comparison, human life expectancy in some developed countries is more than 80 years. "The human equivalent of a 31 year old chimpanzee is about 47 years," Rilling says. "Extrapolating from chimpanzees, we could expect that human white matter integrity would peak at age 47, but instead it peaks and begins to decline at age 30. Now that we know this, we can investigate the molecular mechanisms responsible for more rapid white matter deterioration in humans and potentially use this information to one day slow the decline." The researchers collected MRI scans from 32 female chimpanzees and 20 female rhesus macaques and compared them with a pre-existing set of scans from human females. 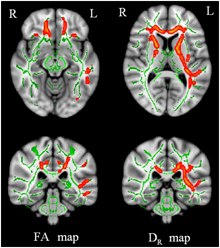 They used diffusion-weighted imaging (a form of MRI) to examine age-related changes in white matter integrity. Diffusion-weighted imaging picks up microscopic changes in white matter by detecting directional differences in the ability of water molecules to diffuse. When the myelin coating of axons breaks down, water molecules in the brain can diffuse more freely, especially in directions perpendicular to axon bundles, Chen says. Grants from National Institute on Aging (P01-AG026423), the NIH Director's Office of Research Infrastructure Programs (Primate centers: P51OD11132), and Research Council of Norway (204966, 177404 and 175066) supported the research. Reference: X. Chen, B. Errangi, L. Li, M.F. Glasser, L.T. Westlye, A.M. Fjell, K.B. Walhovd, X. Hu, J.G. Herndon, T.M. Preuss and J.K. Rilling. Brain aging in humans, chimpanzees (Pan troglodytes), and rhesus macaques (Macaca mulatta): magnetic resonance imaging studies of macro- and microstructural changes. Neurobiol. Aging vol, 1-13 (2013).